Bonnie & Barack. Ringling Brothers and Barnum & Bailey Circus, 10/2010. Photo: ï¿½ Ringling Brothers on Facebook. Barack, born on "inaugural eve of the 44th President of the United States at 11:50 p.m. and weighing 250 pounds," was the 22nd birth for the Ringling Brothers and Barnum & Bailey Center for Elephant Conservation. His birth was also the first calf born to the Ringling program via artificial insemination. His dam was fourteen year old, first time mother Bonnie, taken off the road just a few months before the birth. The father was determined by DNA testing; two male donors were used in the insemination process. 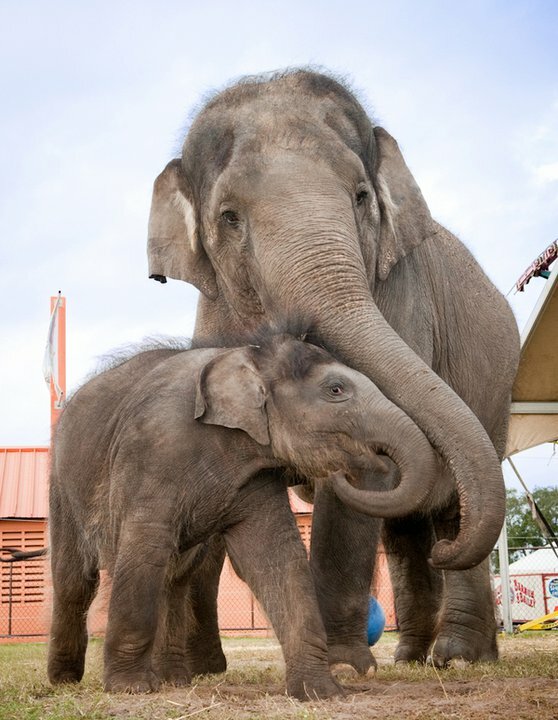 In January 2010, after appearing at the first two stops of the new Ringling Blue Unit Tour in Orlando and Jacksonville, year old Barack and his mother were returned to the Ringling Brothers and Barnum & Bailey Center for Elephant Conservation in Polk County after he contracted the deadly elephant herpes virus. At the time, it was unsure whether he would return to the road later in the season. Barack and Bonnie returned in July after his full recovery.